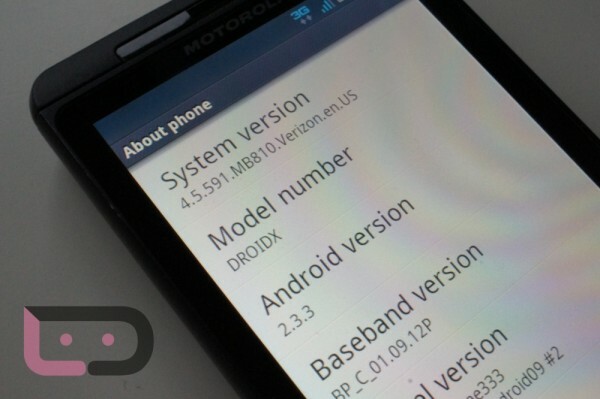 Another version of Gingerbread (Android 2.3) has been released for the DROIDX, this time as version 4.5.591. We’re being told that if you are running one of the other 2 leaks, you can install this right over the top assuming you haven’t modified anything. If you kept it completely stock but with root, then you should have no problems flashing this. If you have modified anything, you’ll need to return your phone to a stock state or you will more than likely run into issues. *Rooted users only. If you need to root, use GingerBreak. *If you lose root afterwards, use GingerBreak to re-root. *Nandroids back to Froyo will no longer work after updating. SBF still will. *Only change made was to the build.prop to show all apps in market. 1. Drop whichever file you choose from above onto your SD card. 3. Flash as you would any other .zip file. Full support can be found at My Droid World.